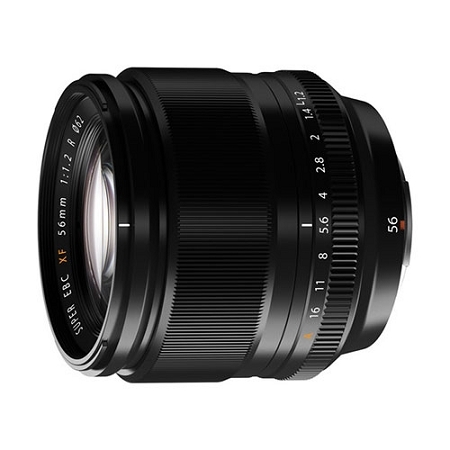 The Fujifilm XF 56mm f/1.2 R Lens is a prime portrait-length lens that provides a 35mm-equivalent focal length of 85mm when used with Fujifilm APS-C-sized mirrorless digital cameras. A bright f/1.2 maximum aperture greatly benefits selective focus control and also aids in shooting in low-light conditions. The internal focusing system, as well as the use of a stepping AF motor, ensures quiet, smooth, and precise focusing capabilities that are ideal for both still and video applications. One double-sided aspherical element, two extra-low dispersion elements, and four front-facing convex elements are integrated into the optical design to reduce chromatic aberrations and to benefit overall image clarity and sharpness. An HT-EBC multi-layer coating helps to minimize ghosting and lens flare for higher contrast and an additional coating has been applied to the rear side of the front-most lens element to further reduce ghosting that is common to lens designs with deep concave elements. Prime short telephoto-length lens provides a 35mm-equivalent focal length of 85mm, making it ideal for portraiture and other applications where a slightly longer-than-normal perspective and flattening appearance is desired. Bright f/1.2 maximum aperture is well-suited to low-light shooting and for controlling focus placement for shallow depth of field and selective focus applications. Two extra-low dispersion elements, one double-sided aspherical element, and four elements with convex surfaces facing the front of the lens help to reduce chromatic and spherical aberrations and contribute to high overall image sharpness and clarity. An HT-EBC multi-layer coating minimizes lens flare and ghosting to deliver contrast-rich, color neutral imagery. An additional coating has been applied to the reverse side of the front lens element to further contribute to effective ghosting and flare reduction. High-speed precision stepping autofocus motor is ideal for quickly and accurately acquiring focus and ideal for moving subjects and video applications. An internal focusing mechanism maintains the overall lens length during focus for faster, more reliable performance. Finely-tuned metal focus and aperture rings benefit overall handling and durability. The seven-blade rounded diaphragm works to produce an aesthetic out-of-focus quality to benefit shallow depth of field imagery. When used with an X-series camera that features a Lens Modulation Optimizer (LMO) function, the lens' performance is enhanced to deliver consistent illumination and sharpness throughout the aperture range.